A sturdy canvas tote, screenprinted on front and back with images from the Ransom Center's etched windows. A classic cotton cap with the Ransom Center logo. 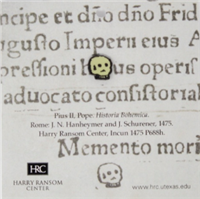 An enamel pin styled after a memento mori found in the Ransom Center's collections. An enamel pin styled after a bas-relief from a temple at Xochicalco. An enamel pin modeled after a pane of the Ransom Center's iconic etched windows highlighting items from the Center's collections. An enamel pin inspired by a typewriter from the Gabriel García Márquez archive at the Harry Ransom Center. An enamel pin inspired by the archival document boxes the Harry Ransom Center uses to store manuscript material. An iron on patch styled after the Ransom Center's iconic windows. An iron-on patch featuring William Shakespeare. An iron-on patch featuring the Ransom Center's logo. An iron-on patch featuring a camera. An iron-on patch featuring an open book.